There is no gift shop, no Lido deck, no musical theater entertainment. Just my kind of cruise! I recently joined Chief Scientist Lynn Russell, PhD, an atmospheric scientist at Scripps Institution of Oceanography (SIO), as a Guest Scientist along with her 4-person research team aboard the R/V Robert Gordon Sproul. 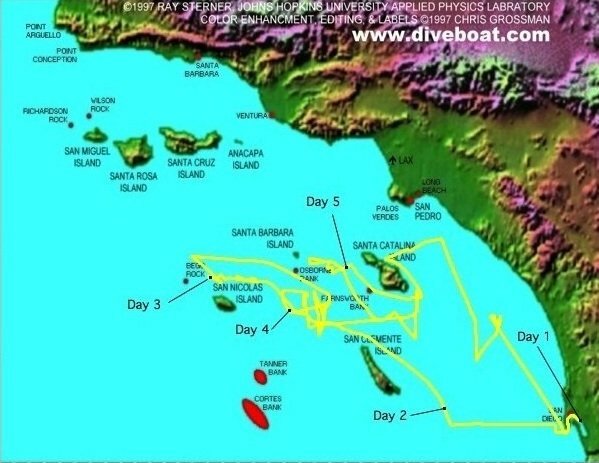 During the 5-day mission off California’s Channel Islands, we collected data on biofuel emissions. Results from data gathered on this cruise will take us closer to understanding the effects of biofuel aerosols on the environment and how they compare with what we know about fossil fuel emissions. This includes learning more about the effects of biofuels on human health. After arriving dockside, I surveyed the ship and noted I am sharing a stateroom with the Chief Scientist and graduate student Michelle. Since only three of us are housed in a six-bunk stateroom, we are taking advantage of the extra bunks’ blankets, necessary for surviving the arctic conditions put in place to prevent the kitchen directly below us from overheating. We’ve now been underway for 5 hours and are collecting data. At the Sprou l’s slow cruising speed (to run an engine emissions check), we’ve only covered 30 miles, but I’m not complaining. It’s a fine day to be at sea, with flat conditions under sunny skies. Yet seasickness has afflicted some of the scientific party right out the harbor though they continue to carry on with their designated tasks. I’m lucky to be born with sea legs so even by noon, when the sea has become wind whipped and white capped, I remain ship-shape and can enjoy the pod of dolphins arriving to race our bow. Though we know we need to reduce our addiction to fossil fuels and their subsequent climate-altering emissions, few studies have been carried out to determine if biofuels are one way to power our vehicles and other machinery while doing less harm than commercial gasoline and diesel to our atmosphere. When any fuel is burned, most particles emitted are so tiny they remain suspended as aerosols. Aerosols influence cloud formation in that each particle can act as a nucleus onto which water vapor clings and ice crystals form—thus a direct link to climate. Biofuels are fuels made from animal fats, vegetable oils, algae, or a combination thereof. On this cruise, the biofuel was equivalent to what restaurants dispose of—a mix of both animal fats and vegetable oils. “We will sample the ship's exhaust [fed with biofuel, commercial diesel, or a mix of both] and measure background air for the control. After returning to port, our installed sensors will remain onboard, operating autonomously and continuously over the course of a year while the Sproul is underway conducting scientific operations for other researchers,” said Prof. Russell. In other words, since emissions are only collected when the ship is underway, we may as well leave the anchor and my swimsuit at the dock because we won’t be stopping. In fact, the crew and scientists will be working day and night. The seas kicked up as much as 24 feet overnight. Traveling northwest with no islands beside us to buffet the wind, we took a pounding. The ship creaked and groaned from the hull repeatedly striking the rolling sea surface with a force that felt as though the ship would splinter. It’s now 5 am, and I’m looking over the bow as a pod of dolphins leap and dive, their splashes lighting up the darkness in green-blue biolumines cence. We had been motoring crosswind to pick up the ambient air (for control data points) but now are back to running with the wind, trying to maintain a heading that keeps the vessel sitting in its exhaust plume. This would be a cakewalk with steady winds but we are saddled with light and variable winds. Just as the compass course is set, 20 seconds later the wind has shifted, and we lose the plume. Kevin mans the trailer, watching the computer screen to track the plume into the snorkel. He stays in perpetual contact with the helmsman, reading wind speed and direction via walkie-talkie to help the captain set (and reset) the necessary course. Emissions are collected in a dece ptively simple way. As the ship motors across the ocean, a plume is released from the ship’s smokestacks. The captain must angle the Sproul such that the bow is heading straight into the prevailing wind so the plume blows straight back into the snorkel. 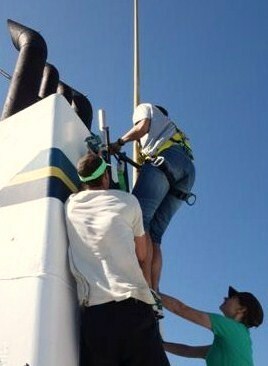 The captured aerosols funnel down the snorkel to be recorded by the banks of electronic equipment within the trailer. It sounds straightforward unless the winds are shifty, and these have plagued us most of the journey. Sleeping in a bunk atop fair seas is akin to swinging in a hammock. This morning, I look out my porthole and see in the distance San Nicolas Island set off by blue sky and smooth, blue water. On deck, a dove has inexplicably landed atop the trailer. Out-of-place wildlife occasionally appears, possibly after becoming disoriented or blown out to sea by strong winds. After a respite, the dove was off again, lost to the sky. News from the bridge: Despite checking with the U.S. Navy’s schedule prior to the cruise, a call into the marine radio notifies us that target practice is underway ahead, so we must exit their space. At least we had some hours of successfully capturing the plume in clean air. We’ve traveled far to find it. The walkie-talkies are now mostly on the fritz so, after troubleshooting, it is decided we will take turns reading out wind speed and direction instead of relegating that info to the equipment in the trailer. I’m here to help. We spelled each other an hour at a time, sitting in front of the meteorological station monitor behind the captain. The captain and crew continue to be upbeat while making labor-intensive incremental compass alterations to get the plume to flow into the snorkel. When it's my turn to take a break, I'm breathless watching the leaps and spins of a long line of dolphins as they repeatedly breach the surface of the diamond-encrusted water. SIO graduate student Jun is measuring emissions from the smokestacks to determine if any particulates are known to negatively affect climate or be carcinogenic. Jun’s work nicely segues with UCLA grad student Michelle’s. She is also collecting particle emissions to identify potential aerosol toxicities as they interact with and function in human tissues. 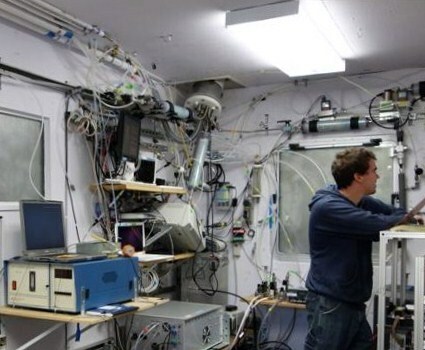 SIO grad student Kevin is tackling the same questions as Jun but is using more highly sensitive equipment in order to reveal precise information about the emissions at the molecular level. The cook is a prickly character, and my being a vegetarian hasn’t endeared me to him but no one can go hungry on this ship. Rise and shine to two kinds of prepared eggs, oatmeal, breakfast meats, pancakes or French toast, some kind of potatoes, biscuits, donuts or pastries, and salad. Lunch always includes soup and maybe sandwiches, mac and cheese, French fries, cooked veggies, and salad. For dinner, there’s soup, steak, enchiladas, baked fish, cooked veggies, rice or potatoes, lasagna, and salad. For dessert, there may be ice cream sundaes, brownies, or apple pie a la mode. In between meals, snacks are set out, with the fridge and freezer always available for raiding. Of course coffee brews 24/7. We are coming to the end of the day, and I spot a rock in the distance. It is Santa Barbara Island, the smallest Channel Island. Even with the constant dronin g of the engine, I appreciate these views and, later on, cruising under a starry night sky enveloped in unseasonable warmth. As we turn back and later motor around Santa Catalina Island, Kevin’s phone picks up a signal. He offers it to Michele and me so we can take a break and access the app SkyView. By holding the phone up to the sky, we can identify stars, planets and constellations “seen” in the phone’s camera. Cool! U.C. Riverside grad student Derek’s work augments all the onboard science in that his data is collected using a federally mandated protocol established by the Environmental Protection Agency (EPA). Put another way, he is essentially conducting a smog check, not unlike those required for cars. In this case, Derek is generating standardized benchmarks for all cruise data collected. Jun is following Derek’s work with another project, that of developing a new and improved technique for measuring particle emissions. This work has potentially far-reaching implications for determining emissions standards in the future. As I take in a yellow sunrise, we are heading back to San Diego, collecting emissions data from polluted air close to the coast. In fact, there is a bonus. A fire rages in the distance on Camp Pendleton. Not part of our objective but a welcome coincidence. Again, there are military operations on the water but we expect this around San Clemente Island. An incoming radio call warns all mariners to exit the area. Don’t need to tell us twice, even though changing direction means losing the mercurial plume we have enjoyed for more an hour. No matter. We’ve had a successful cruise, with good data being collected every minute. 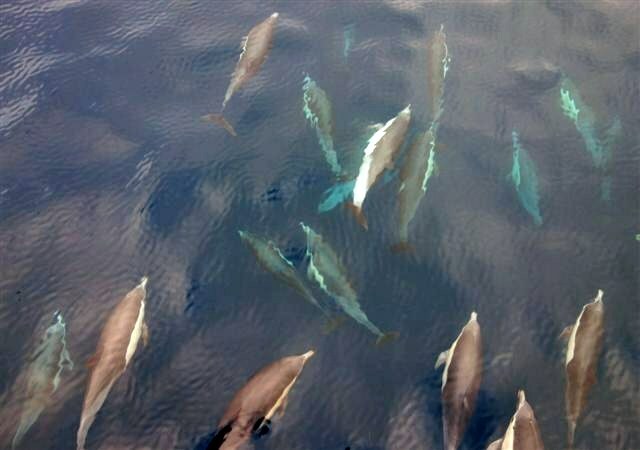 This is only a snapshot of work and life on one oceanographic cruise. I saw firsthand that when it comes to shipboard science, unpredictability is the norm. Out at sea there is no additional technical support, no running to the store for parts, no ability to control the weather, and no way to make the floor hold still. I found the scientists and crew to be an unfailingly optimistic and dedicated group. 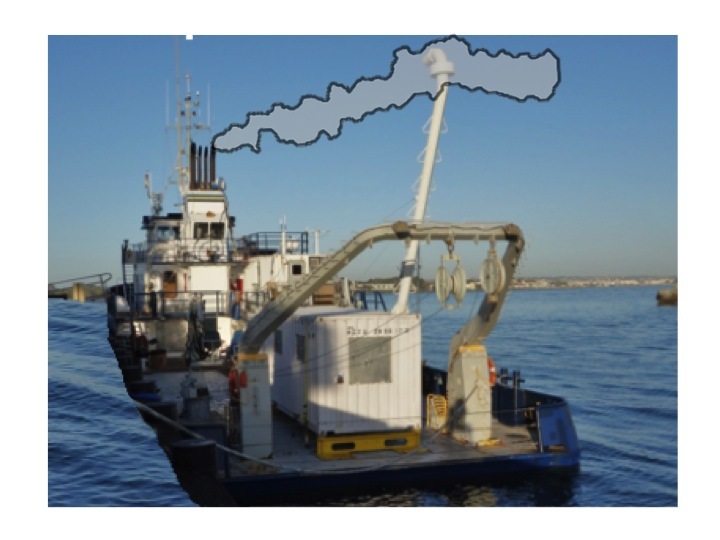 After a year or so, when all data have been collected and analyzed, I will follow up with another article on the results (see Scripps research vessel realizes biofuel milestone__Part 2.) But for now, when reflecting on my adventure, I feel privileged to have participated in contributing to the betterment of our ever-changing natural environment. The R/V Robert Gordon Sproul, named after a past U.C. president (1930-1958), was built in 1981 and measures 125 feet. Owned by U.C. San Diego, it has a permanent crew of 5 and can hold up to 12 scientists. This Sproul cruise was supported by the U.S. Dept. of Transportation Maritime Administration.